A Guaranteed Plan For Remodeling Success! Who doesn’t love the idea of turning a once dark, unfinished Basement into a bonus room for entertaining family and friends, or an in-law suite that can help you earn passive income? For many, reclaiming this valuable space in your home can make all the difference between loving or listing your house now or in the future. When it comes to LOVING your home, here are a few of Riverside Construction’s best before and after basement remodels that dare to inspire you—what a basement can be. Have kids or teenagers? Creating a family media room to watch movies and hang out as a family is a perfect way to enjoy your basement. This family wanted to curate space for a media room including a custom audio and video system, an arts and crafts studio, lots of new storage, a half bath, and a practical kitchenette. Riverside Construction took this family basement from a cold empty storage space, where no one wanted to hang out to a multi-functional basement the whole family can utilize and enjoy. View this Project Portfolio. Have a sport-loving family that needs a place to hang out in the winter? Create a multi-functional space where kids and adults alike can be entertained for hours. This sport loving family wanted a pseudo indoor basketball court to keep the kids entertained during the cold winter months. The main TV area includes custom built-ins perfect for highlighting family mementos while hiding all of the media equipment. A custom kitchenette was installed including a microwave and beverage cooler, along with a full bathroom. A stylish barn door hides a fully-equipped exercise room, and lots of storage space was carved out, so everything has a home. This basement went from hardly used to the favorite spot in the house! 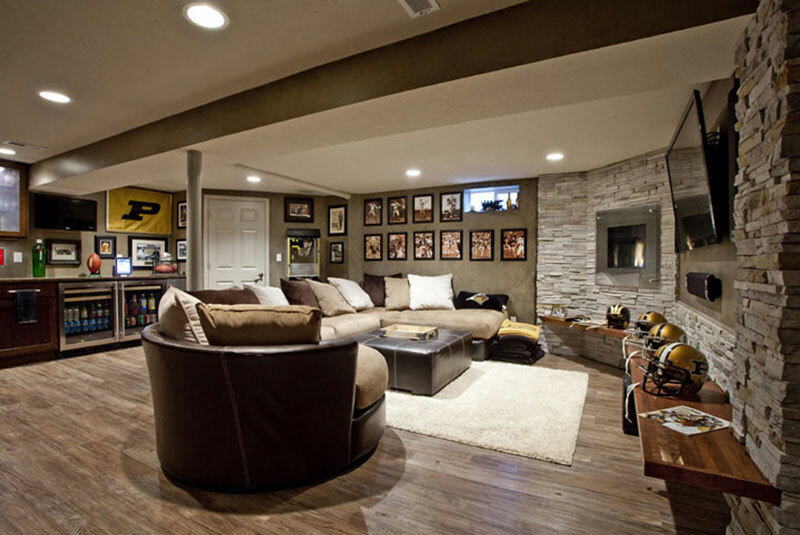 One of our clients was a die-hard Purdue fan and wanted us to transform his dark and dreary unfinished basement into the ultimate sports-themed man cave. This cool industrial style basement remodel started with an eye-catching custom wood and metal staircase. A food and beverage area holds dual beverage coolers, a wine refrigerator, sink and a dishwashing drawer perfect for handling all the food and beverage needs for watching the big game. The stunning statement fireplace wall includes floor-to-ceiling stacked stone, an elevated gas fireplace, media center and a wrap around floating walnut bench, perfect for featuring sports memorabilia. Can we say go Boilermakers? Have Aging Parents or Young Adult Children to Take Care of, and Could Use a Basement Apartment? Converting your basement into private living quarters is ideal for resident family members in need of independence – with all the benefits of living just downstairs. If you have young adult children or aging parents starting to need more help, converting your basement into an in-law suite may be just the solution you need. It not only gives you considerable flexibility in how your basement is used but also increases your home’s resale value. This Lafayette family’s basement was pretty typical with both finished and unfinished areas, acting mostly as a catch-all space for things and an extra place for a guest to sleep on a sofa. Every square foot of this walk-out basement was transformed. Riverside Construction started by building a fully functional mini kitchen that includes a dishwasher, sink, refrigerator and electric cooktop. Directly off the kitchen, we added a washer and dryer. Riverside Construction also designed a comfortable seating area, perfect for social gatherings and comfortable tv viewing. A bedroom and full bathroom round out this fabulous in-law suite basement remodel. Have a hobby or interest that you would like to devote space to? One of our Lafayette clients was a wine enthusiast and was interested in dedicating part of his unfinished basement to his extensive wine collection. Riverside Construction created this gorgeous custom wine cellar, allowing the homeowners to properly display and store their expensive wine collection. Highlights of this remodel include a unique wood inlay table, a coffered ceiling, and rope lighting to showcase their impressive collection. Think of your unfinished (or partially finished) basement like a blank canvas. Paint in a gym, a studio, an office, or a “man cave” – to name a few ideas – and imagine the endless hours of enjoyment you and your family will find in the finished space. Whatever your downstairs dream room is, the possibilities are practically endless. Here are some more exciting ideas that combine fun and function. If you’re close to making a decision about your unused basement, be sure to read about reclaiming your basement—important steps to consider to ensure you are adequately prepared. If you’re ready to embark on a basement remodel today, we welcome you to schedule a complimentary, personal design consultation with Riverside Construction. As the only design/build remodeling firm in Lafayette, Indiana, we are happy to be a resource to you, guiding you through the entire design and construction process. And, don’t miss our upcoming basement seminar. Our informative seminars will teach you how to design value into your home, budget for your remodel, how long your project should take, current design trends and products to consider, as well as how to choose a reputable contractor. As an added benefit, lunch is provided. The post A 2017 Recap: Riverside Construction’s Best Before and After Basement Renovations appeared first on Riverside Construction. Subscribe to A Guaranteed Plan For Remodeling Success!